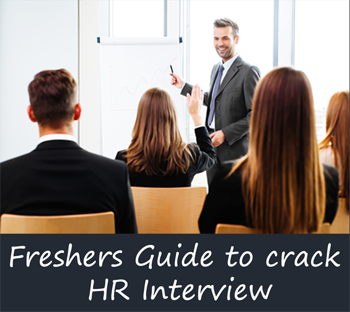 Complete guide for Freshers to crack Human Resource - HR Interview with best Preparation tips. This article discuss in detail, frequently asked questions and qualities a candidate should have to clear the HR Round. “Cleared man!! I am through technical round!! There’s this simple HR round now & it should be done” Heard this before ? Most candidates have a misconception that, HR interview is a mere formality to give you an offer letter. Although in few cases, it is true, but in this current competent market scenario, it isn’t true with most recruiters. With so many to choose from, and little separating the technical skills of freshers, HR round becomes an important differentiator to shortlist the right candidate. If an organization was a machine, the technical skills of an employee becomes the core machinery & their soft skills will be the lubrication - for a smooth run, you need both. That’s where the HR round becomes so important for a fresher recruitment. Corporates like to hire candidates who are good at their soft skills and compatible with their organization, as much as they can do a technical job. Sit straight and keep a comfortable posture. Do not lean or sit on edge of the seat, nor lean back too much. Keep eye contact. Don’t look into oblivion (read ceiling, curtains etc. ), while answering. Keep a pleasant and smiling expression and show an interest in the proceedings. Answer with simple, clear words and loud enough for the interviewer to hear. It’s okay to say “Don’t know”. That shows your comfort in accepting things you don’t know about. Note: Don’t overdo “Don’t know” stuff. That might turn against you. Each company has a different working culture. When a company evaluates a candidate, one major quality they will look for is how compatible you are with their working culture. Although you get information online on major corporates, preparing for this becomes slightly tricky for lesser known companies. So getting prepared for this part is not 100% feasible, but here are few things you can do, to avoid failing this. Show flexibility – HRs see a freshers as a fresh clay, which could be molded to suit the company environment. Show them you are that, rather than a hard seasoned pot. Keep your options open, like working hours, location etc. unless absolute necessary. Understand that, it is important to kick start your career, rather than looking for comforts. Stay neutral – Do not overreact or speak out extreme suggestions about any general topic, for which your opinion is asked for. They might be trying to evaluate you against one of their company policy. Example: “What is your opinion on gay rights?” Don’t answer with a condescended tone or be disrespectful. Just answer neutral something like “Everyone should have the right to make choices based on personal preferences, which should go in line with the legality of the country”. Stay legal/ moral – All company policies are based on legal code of the country and moral values. Understand this and while answering, stick on these lines. If question is “What will you do if you see a female colleague being harassed by your friend?” Your answer should be “I will report it to the manager.” An illegal conduct has zero tolerance in any corporate culture. The USP of a fresher to any company is the flexibility in utilizing his/her ability within its different operations - This could be for an expansion plan, an existing delivery process, for a product development team. This is only effective, only if the learning ability of a candidate is strong and steep enough - that is efficient and quick. The learning could be of a new technology, a new culture, a new life style. Your academic graphs is one of the important indicators for this (& hence the cut offs). But that’s just one aspects and remember, you already cleared that hurdle. This is mostly evaluated by few indirect questions – like asking about your experience with team work, any challenges you faced, project works, other trainings (academics / non-academics) you did outside regular schooling. It will be prudent to have at least one example which will showcase you are willing and efficient in learning new stuffs. Of course you know this – the compensation. A fresher doesn’t hold much bargaining power. But nevertheless, this is a common question asked during the interview. “What is your expected CTC?” Learn about the fresher’s package of the company & try to stay within the limits. All that a HR is trying to look here is, are you really interested in a company like theirs. So when a mid level company usually offers a package of 3-4 L for a fresher, and your answer is 10L, then it says you are looking for a top level company.